Transistors make them totable, batteries make them portable. Here’s your buyer’s guide. THE first time you see one of these little TV sets, you may wonder what all the fuss is about. Didn’t we get rid of those midget screens back in the early days of television? But the next time you see one—with the picture turned on—it may be a case of love at second sight. What’s happened to TV is the same thing radio went through. First we had only the bulky set in the living room. Then, with the development of transistors and the art of miniaturization, radios shrank. You could carry one anywhere, even put it in your pocket. That’s what these tiny TV sets are—personal. They let you watch your favorite show-in your bedroom, car, or boat, at the beach, on a picnic. How much do they cost? Prices start around $150 and range up to $200— about the same as big-screen portables. How good are they? 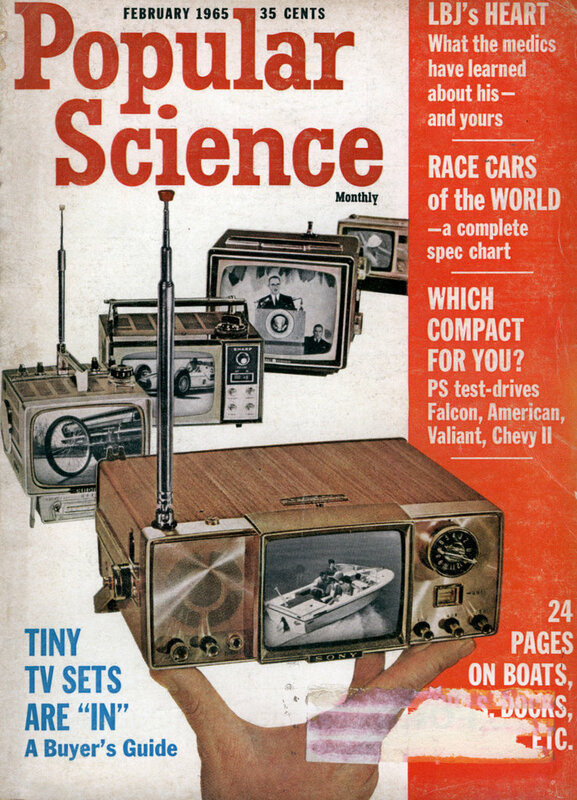 To find out, Popular Science tested the eight little TVs shown above. Seven—all except the GE—are from Japan. We were surprised to learn that the Philco set is imported, since Philco manufactured, in the U.S., the worlds first transistor TV back in 1959 [PS, Aug ’59]. We viewed them in cities and in the suburbs; we took them to the beach and to mountain resort areas; we tried them in cars. Our conclusions: The personal portables perform so well that they can’t help but be popular. 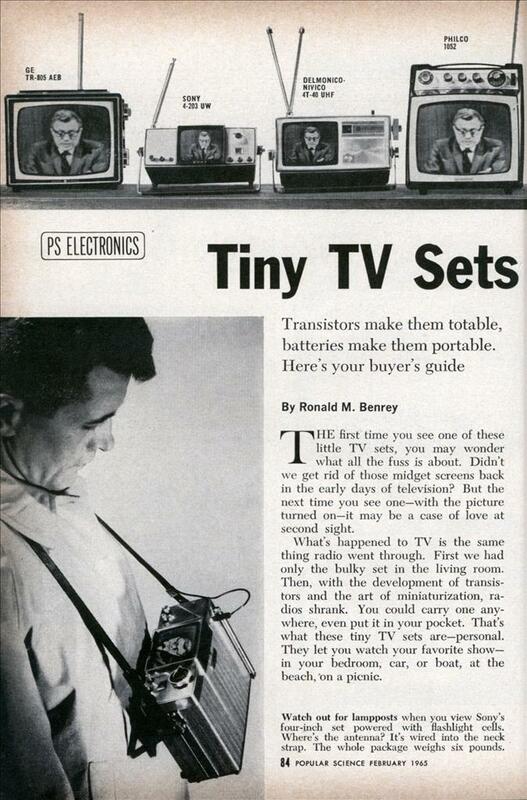 Here’s why: The miniature TVs are genuine portables. They are compact—the largest is as big as a bowling-ball bag, the smallest about the size of a desk dictionary. They are light enough to tote around—most weigh under 10 pounds, about as much as a big-screen “portable.” They are full-size in performance, though, thanks to sophisticated, space-saving, transistor circuitry. They can be powered by rechargeable battery packs as well as 117-volt AC house current, so you can view them away from the power lines. Most of the sets will run four hours on one charge; recharging takes 10 hours. The battery can be recharged approximately 50 times before it’s worn out. A battery replacement costs about $11; that works out to about six cents a viewing hour. The Delmonico and Sony four-inch sets can also be powered by nonrechargeable flashlight cells; cost per viewing hour is much higher—about 40 cents. Special interference-killing circuitry and a wide array of accessory mounting brackets and connecting cords let you watch them in moving cars (from the back seat, of course) and boats. Their small screens—ranging from a snapshot-tiny four inches to a magazine-size nine inches—are perfect for close-range personal viewing. You’ll be surprised how quickly you get used to a small screen. One reason is that you can’t see the scanning lines that make up the picture, as you do on a big-screen set. Don’t plan to scrap your big-screen set, though. The personal portables aren’t meant for family viewing. More than two viewers in front of a tiny TV-especially the four- and five-inch-screen models—makes a crowd. They re ruggedly built. The flyweights will ignore jouncing and rough treatment that would send a conventional TV to the repair shop. And they’re equipped to travel: A carrying case or snap-on protective front lid comes with (or is an optional accessory for) every set. All of the small TVs performed flawlessly during the PS tests, although we didn’t test them long enough to judge their lifetime durability. But a transistorized TV should be more trouble-free than a tube set since the two major causes of TV-set breakdown—burned-out tubes and circuit components overheated by glowing tubes—have been eliminated. Servicing is no problem. The baby TVs use computer-type plug-in printed circuit boards that most servicemen can fix. For major repairs, the set makers maintain service depots in large cities. The sets are light enough to mail for servicing. Their performance is amazing—picture quality and sensitivity are excellent. In a side-by-side test in the suburbs the little TVs pulled in 50-mile-plus stations with their built-in monopole telescope antennas alone; a more expensive big-screen set needed a rooftop antenna. In keeping with the recent federal law, the sets have all-channel tuners, which means they can receive the 70 ultra-high-frequency channels (14-83) as well as the 12 very-high-frequency channels (2-13). All the little-TV pictures are bright enough for daytime outdoor viewing. At the beach, and on very sunny days, you’ll need a sunshade to cut glare on the screen. How do they sound? Like good-quality transistor radios. To keep power drain low—so they can be battery-powered— these TV sets use relatively low-power audio circuits: Most have a sound power output of about 1/5 of a watt—enough to produce normal volume levels indoors. Outdoors, or in very noisy indoor locations, you can use an earphone. Choosing a tiny TV. It’s harder than you think. To our surprise, all eight sets perform about the same: very well indeed. We d be nitpicking if we singled out petty differences in picture and sound. But there are other things you should look for. Each of the sets has a slightly different personality—you should find the one that matches yours. •	The four-inch sets are strictly one-viewers—unless two people are very good friends. •	The five- and six-inch sets make ideal table-top TVs, are excellent for carrying from room to room: from kitchen table, for breakfast and the morning news, to night table for a late movie. •	The nine-inch sets make ideal second TVs. They combine the best of two worlds: Optional battery packs and a raft of accessories adapt them for use anywhere. Yet the picture is large enough for a small group to watch.